The Canadian Residency Accreditation Consortium (CanRAC) was formed in 2013, comprised of the Collège des médecins du Québec, the College of Family Physicians of Canada, and the Royal College of Physicians and Surgeons of Canada. 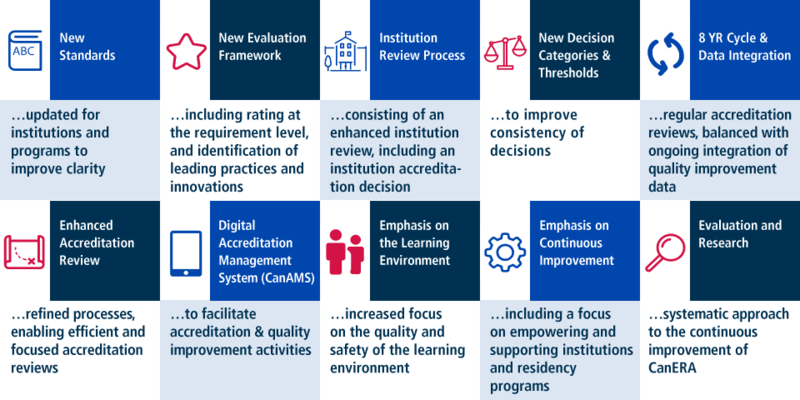 The objective of CanRAC was to embark on the reform of the accreditation system in response to feedback from residency accreditation stakeholders. This is in light of changes which were underway in medical education with competency-based medical education and in keeping with the three colleges’ commitment to broader discussions as part of the Future of Medical Education in Canada Postgraduate Project (FMEC-PG). The FMEC-PG mandate was to identify opportunities for alignment, streamlining and better coordination of accreditation processes across the continuum of medical education. ensure that residency education adequately prepares residents to meet the health care needs of their patient populations upon completion of training.